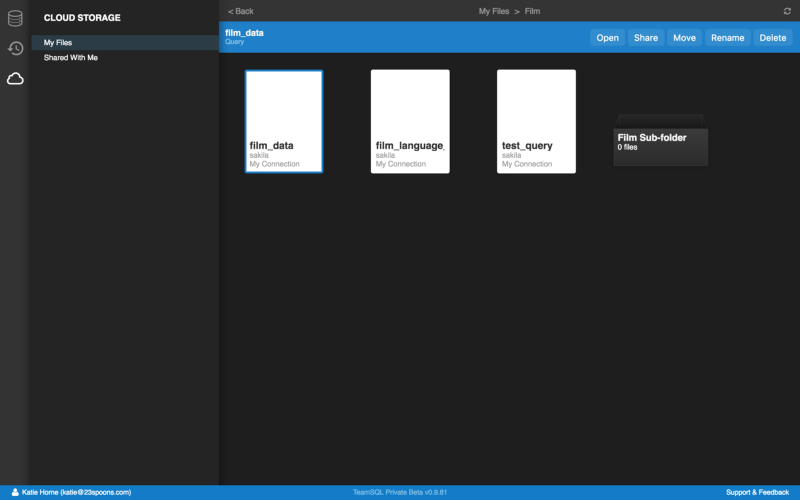 In this article, we will cover the features TeamSQL has that enables easy collaboration between you and your colleagues. To create a new team, which you can use to group any number of users, navigate to Teams > Create New Team using the main toolbar at the top. You will be prompted to provide a name for your new team. A prompt that allows you to invite new users. Provide their email addresses, and they will receive invitations to join your team. A list of members that are currently a part of your team. For new teams, you will be the only member. A list of users who you’ve invited, but have not yet joined. Note that, using this window, you can also delete any of your teams, as well as create additional teams. You can use the Teams & Management window to invite users to TeamSQL and add them to existing teams (the process for adding someone who already uses Team SQL to an existing team is the same). TeamSQL automatically displays this window after you create a new team, but if you ever need to return to this window, you can use the main toolbar and navigate to Teams > Teams & Management. When inviting users, you invite them to join a specific team. As such, the prompt that you use determines which team the user will join. If you would like to invite a user to join multiple teams, you’ll need to invite the user to join each team individually. Once you have created teams and invited your colleagues, you can share the queries you’ve created with them. To share queries, you’ll use the Cloud Storage area, which you can bring up using the cloud icon located in the left-hand toolbar. Select the query you want to share. You will see an Options toolbar. Click on Share to begin the sharing process. 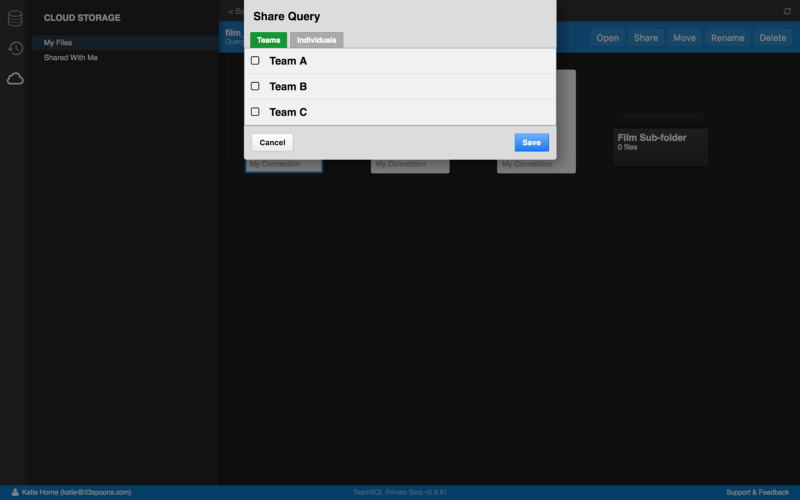 By default, clicking on Share brings you to the Team Sharing tab of the popup. Select one or more teams with which you want to share your query, and click Save to proceed. Please note that, once you share a query with a team, any new users to that team will be able to see the query. 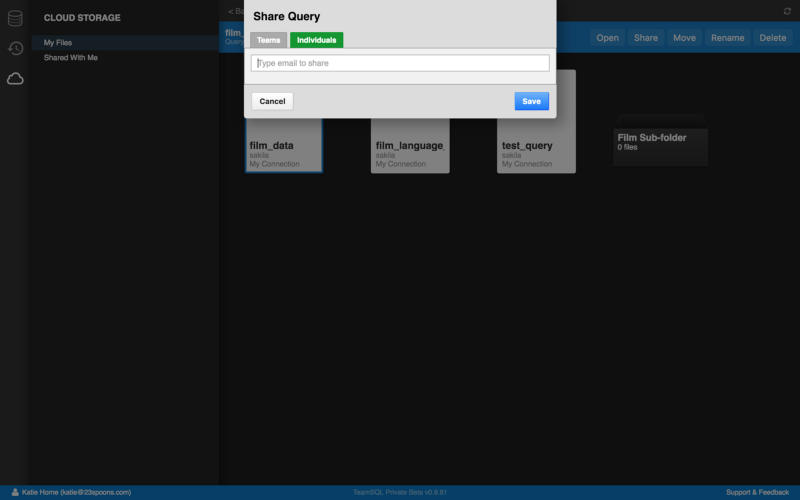 If you want to share a query with a specific user, click on Share to bring up the sharing pop-up. Navigate to the Individuals tab, and provide the email address of the user to whom you want to share. Click Save to proceed.